Stage name of William Oliver Wallace, of Scots-Irish parents. Raised in England. Marketed 1st invention at age 16. Co-founded Medway Magical Society 1947. In London worked at the Unique Magic Studio 1954-56, the Chavel Magic Corner 1956-60, and managed Hamley's Magic Studio 1960-64. IBM British Ring Shield 1964. Developed his "Shriek of Araby" act in early 1960s. Full-time pro comedy magic since 1964. 1972 Magic Circle "Magician of the Year" award. 1975 AMA Best Lecturer. British Ring Past President. Advisor for TV series of David Nixon 1970-78 and Paul Daniels 1979 until his death, plus other theatrical shows. 1991 David Berglas Award. 1993 AMA Masters Fellowship. 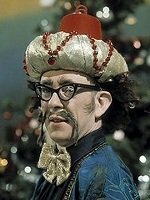 Wrote The Bongo Book (1966, 64pp), Be A Magician (1979), and Ali Bongo's Book of Magic (1980). 1980 AMA Creative Fellowship. Tricks in Abra and Genii . A collection of 21 columns Ali Bongo wrote for Abracadabra magazine. The column was called "Backsheesh" and teaches mostly comedic parlor and stage effects.